When Tom Laroye and Yam Who? debuted their impassioned disco cut 'Hit It Off' last year it immediately captured the hearts of its listeners. Now, the release is given fresh life for 2019 with a new digital package featuring their Extended Disco Version, and two remixes from legendary Australian selector Late Nite Tuff Guy. Written by acclaimed soul artist Benny Latimore, and made famous my Millie Jackson in 1979, the track was initially translated for the dance music world by Tom Trago. 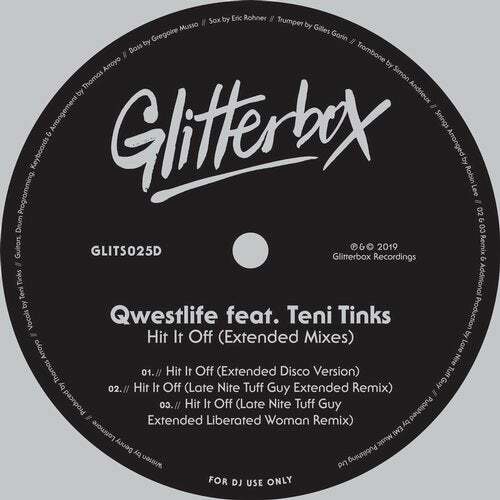 Qwestlife's take on the record features the unmistakable voice of Teni Tinks, who brings true diva flair to the track. With joyful chorus and smooth production, the duo demonstrate their ability to craft modern disco with traditional analogue techniques in the Extended Disco Version. Late Nite Tuff Guy's Liberated Woman Remix takes the listener on a funked-up choppy journey, while his Extended Remix has the silky-smooth sound of a 1970's club classic.